Aight ya’ll. You asked for it. We shared with you a picture of a new bread recipe on Facebook and Instagram last week and you responded – no, wait – you demanded that we share the new recipe with you. This bread recipe is so easy, even a man can make it. It was after all, developed by one! It’s just as easy (if not easier?) than the No-knead Overnight Artisan Bread, which many say is the easiest bread in the world. 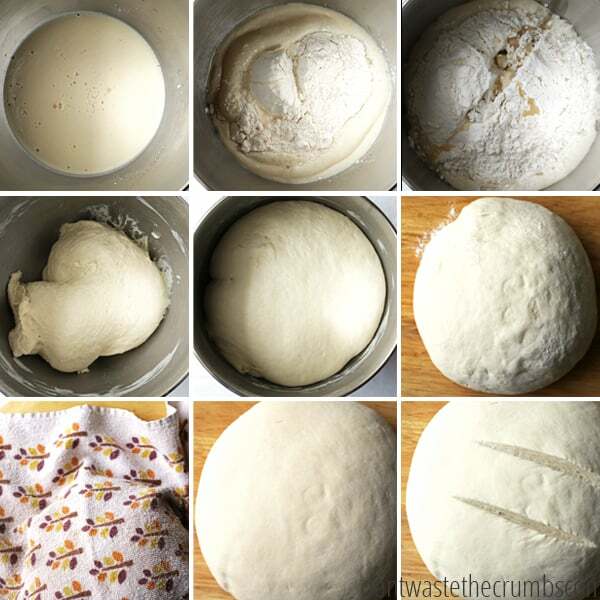 And if you doubt me and say “baking bread is too hard” or “I’m scared of yeast,” I’m here to tell you that this loaf is your new best friend (and here’s a beginner’s guide on using yeast). 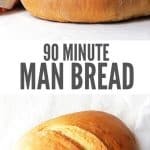 Why is 90 Minute Man Bread so great? For starters, there’s no refined sugar. It’s sweetened with honey and has a tasty hint of coconut oil. A healthy bread recipe developed by a man who once survived on Doritos and soda? Proof that picky eaters really can switch to real food!! Next up, you can treat yourself to this ginormous, football-sized loaf of delicious goodness in just 90 MINUTES. That’s a quick rise, little effort, and yum-o in your belly in no time. Finally, this recipe was a complete accident. Which means it’s highly unlikely you can get it wrong. Perfect for the novice cook, or fellow husbands out there. Well, I’m going going out on a limb by saying this may be the BEST and easiest sandwich bread we’ve ever made. At first bite, we rejoiced. Despite its size, it holds up to the hacking of a knife and smearing of butter and peanut butter very well. Granted, we love our Potato Bread, Maple Oatmeal Bread, Rosemary Olive Oil Bread (and more) – but this is just SO much easier! Even funnier: we’ve made 3 loaves of this stuff in 2 days. The first was obliterated by the family with a couple sticks of butter. The second loaf was used for grilled sandwiches. The third was a final test loaf to ensure we could replicate this recipe and that it wasn’t too good to be true. I’m eating that one as I type this. Take one of your halves, and cut into slices. Trust me, the slices are plenty big for your sandwich. These are man-sized slices. Smear with lots of butter. If you don’t have bread flour, you can make your own. Add 1 Tbsp vital wheat gluten to 1 cup of all-purpose flour. You can also use up to 50% whole grain flour in lieu or bread flour or all-purpose flour. I haven’t tested more than 50% whole grain flour personally, but check the comments below to see if someone else has tried this successfully. If you don’t have or want to use coconut oil, you can use melted butter or olive oil – although the flavor will be slightly different. If the flavor of coconut oil concerns you, rest assure this bread does NOT taste like coconut oil. Believe it or not, coconut oil is mildly sweet and tricks the taste buds into thinking it’s eating something sweeter than it actually is (cinnamon also does the same thing). That’s one reason why this loaf is loved by so many people who only eat white bread. Store-bought white bread has added sugar, but this homemade loaf TASTES sweet – despite the fact it only has 1 tablespoon of honey. By the way, this is the coconut oil I use and recommend. I stock up when it’s buy one get one free AND free shipping. If you need coconut oil ASAP and can’t wait for a sale, here’s my runner up choice. Most breads call for loaf pans, but we used our pizza stone. This is the one we have. It’s over 5 years old, been through hundreds of pizza nights and is still going strong. No cracks, despite moving across the country! Plus it makes your pizza and bread taste pro-artisan (a.k.a. makes you look like you know what you’re doing). Update: A reader tried this in loaf pans and it works great! After the first rise, split the dough into two loaves and place into two greased loaf plans. Rise again and bake as directed. For more options on baking, read the comments below. There are lots of ideas to make this recipe work for you! If your kitchen is not warm, turn your oven to low. This is simply to warm your kitchen up a little bit (since it’s cool where we live). In your mixer bowl add warm water, honey and yeast. Stir a few times until honey dissolves. Once yeast starts foaming (5 minutes or so), add flour, melted coconut oil, and salt. Using dough hook, knead for 10 minutes on low/medium low. Leave your dough ball in the bowl and cover with a towel. Let rise for 30 minutes. After the first rise, lightly flour a surface and scoop your dough ball on it. Knead your lump of dough by hand a few times, until it forms a firm ball. Cover this ball of dough with a towel. After the second rise, place dough ball directly on pizza stone, cut two slits on the top of the dough ball and bake for 25 minutes at 400 degrees. If you are using a loaf or cast iron skillet, the cook time may need to be increased an additional 10-15 minutes. (bread is done when the internal temp is 220 degrees). *We move this dough from the counter to the pizza stone, but if you don't feel confident in that transition, flour a piece of parchment paper and shape the dough on that for the second rise. Then move the entire paper with the dough to the oven for baking. This delicious bread recipe was inspired by a “I wonder what happens if I…” Have you ever made a similar recipe and created something delicious? Can I use any kind of flour or does it have to be bread flour? Making man bread as I write and about 10 minutes in the oven one side kind of exploded where I made the cut! Other side is looking premium at the 20 minute mark. So question is…why did it explode? Not deep enough cut? Too deep? Smells good! Hey Randy! Explosions are caused by the sudden expansion of air inside the dough. Did you add the coconut oil? Fat helps to prevent blow outs from happening, as does a humid environment (dough covered with a towel when rising, spritzing with water before baking, or adding a small pan of water inside the oven as it preheats). The cut helps to control where you want the expansion to happen, but if it happened on the side, it’s likely either the fat or humidity factor. It should taste just as good! Glad it worked out for you Tammy!! i tried AP flour. the dough was just too soft. il should have kneaded in more flour during the 2nd rise. when i tried to lift it to the stone, it lost half its loft. my gut feeling was to put it on parchment so the transfer would go smoothly. that would have worked. all in all, this is the BEST tasting bread i’ve ever made. the coconut oil/honey combo is a winner!! bread flour next time. Parchment paper is a great suggestion – I’ll add this to the recipe above. Thank you! I use all purpose flour 95% of the time for all my breads. And I don’t usually add vital gluten unless the bread has more than 50% whole grain flour in it. Can this be adapted for the breadmaker? Hi Patti! We don’t have a bread maker, so I can’t say for sure. The rises are really short, so to be honest, I don’t see why the bread maker would be necessary! Hello Tiffany! What if you do not have a standing mixer, this would be why I would use a bread machine, because it mixes am I right? Oh yes, you can use a bread machine for the mix cycle. I don’t have one, so I don’t know exactly how they work, but if you can just mix and not do the rise, then go right ahead! Thanks, I don’t have the mixer you spoke of but our bread machine makes mighty fine mixed dough and then rings when it’s time to remove before the rise cycle. I didn’t use a bread maker and kneaded by hand and it turned out wondefully! I just made this yesterday and gove rave reviews by all four guys in the house – dad and three boys 🙂 Also, I plan on making another loaf today – this truly is the easiest bread to make and I highly recommend it. Thank you for this recipe! It would save all the kneading involved! Hey! I made this today for the first time and I did the whole thing in my breadmaker. I put it on the expressbake (89 min) and it turned out perfect! I will definitely be making this again! Thank you so much!! I will have to try in my bread maching on express bake as well. I am looking forward to it. I[‘n sure my husband and two boys will get a kick out of the name as well. When you made it in the bread machine, what order did you put the ingredients in? Normally, in a bread machine it would be the water, then the honey, then the coconut oil, flour and salt, and the yeast would be last. My machine has a quick bread function for both artesian and regular white bread. Which would work better. Hahaha, what a funny name. The REASON is funnier. But in all seriousness, your bread recipes are among the best ever. You KNOW I’ll be trying this. Maybe even with dinner tonight. Thank you so very much, Tiffany, for posting the recipe and your helpful hints. Have a lovely day and God bless. You’re incredibly welcome M – your comment brought a big smile to my face!! I hope you enjoy it as much as we do! Okay, Tiffany. HOW do I keep it for dinner? It’s out of the oven, cooled, and sliced. I notice pieces keeping disappearing. Yes, it’s THAT good. Thank you so much for this wonderful recipe. This one is going in our “favorites rotation”! Have a great evening. I know I will-fresh bread (if it lasts!) with dinner. After the dough has risen the last time how do you get it transferred to the preheated pizza stone without deflating it? This looks delicious!!! Can’t wait to try it. You move fast. 🙂 If you have a stone, pull out the rack first, then as best as you can, put your hands under the loaf, pick it up and transfer. Then slash on the stone. If you’re inverting a cookie sheet, take it out and rest on the stove so the distance to move is shorter. Slash once it’s on the sheet, then put it back in the oven. I know what you’re thinking Amy, but because of the two short rises, this dough doesn’t get super inflated with air like traditional bread recipes do. Don’t worry, you can do it! So curious, I like to make loaves that look a lot like this in my enamel coated cast iron pot. It is a 6.5qt round pot. Would that be okay to try? It would probably work Kimberly! Preheat the pot as you preheat the oven, then put it in and bake! We are a whole wheat kinda family, would wheat flour work here? I have vital wheat gluten so I could mix up bread flour that. Just not sure how if the rise or texture would vary too much with whole wheat flour. I am endlessly searching for great bread recipes. We haven’t tried wheat yet in this recipe, but I’ve subbed 50/50 in almost every “white” bread recipe without any issues. Definitely add the VTG if you try this, and let us know how it goes!! I do a similar recipe to this and use 4 cups wheat flour and 1 cup white. only mix 1 c water at first and after yeast foams add the remaining. The rest of the directions the same. Keep the dough on the sticky side. Bake at 400 in 2 smaller bread pans. I make this about every 2 weeks. We love this recipe! I’ve used it with wheat flour and AP flour, but then I add the extra 1 Tbsp of Vital Wheat Gluten per cup of flour. It rarely lasts long in our house. It’s become our go to bread recipe. No it’s not needed Malinda – old fashioned arm muscles will do the trick too! LOL – nope! But you can place the bread beside the oven like we do. Usually there’s just enough heat from the oven to keep the dough warm. my husband just saw this over my shoulder and said, “man bread? honey? sounds good!” thanks! I just cannot tell you how close I have been to giving up on making bread! I have tons of books about it and have tried more recipes(that took 6 hours each) than I care to remember. This recipe is awesome! Fluffy, chewy, crusty bread. A dream! So glad you liked it Kk, and that it’s given you hope on bread! It says mixing for 10minutes on the dough hook? Any advice on timing if i opt to do so by hand? Would 10 minutes be sufficient? Hi Jason – when mixing by hand, you’ll have to knead until the dough is smooth and elastic. 10 minutes might be enough, but feel free to up 15 if the dough is sticky. Hi Tiffany, I made this bread tonight and only switched out coconut oil for butter (so my family would eat it) and it was so yummy! However, I rarely see other foodies using bread flour and wondered if it is really a “whole food”. But I guess it’s ok if it’s more like a treat. It sure is good! Hi Debbie! So glad you enjoyed it! What about using whey in place of water? We haven’t tried whey in this specific recipe Donna, but I have in others. If you try it, please update us and let us know how it goes! Hi Ari! I’ve used that flour before in other baked goods (I made pretzels) and it’s great in recipes that don’t need a rise, like cookies and brownies. I don’t know if I’d try it in this recipe though. Breads need a “lift” and they get that from the gluten in flour. Unfortunately, you can’t just sub GF flours in traditional bread recipes. You’d have to specifically find a GF bread recipe instead. Did you ever try the GF flour? I am curious how it worked out. I ended up adding an additional 1C-1.5C of flour as it was just not forming a ball when mixing with dough hook. Could it be because it is so humid here in MN?! It could be Amy. All baking recipes will vary a little bit because of the region. It’s pretty dry out here in California! I originally found you on Pinterest from your 10 Foods that Regow in Water Pin then BAM! 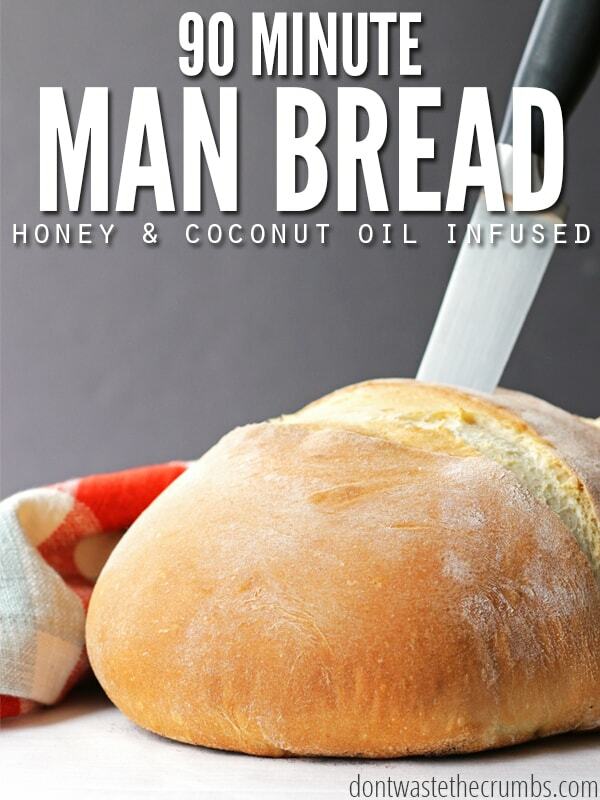 You reeled me in with this “Man” Bread so I had to check it out! Will definitely be trying this one but meanwhile, sharing your page! Thanks!! I just made this using 1/2 fresh ground whole wheat flour and 1/2 AP, it turned out great! I let it rise about 15 minutes longer than you have listed and I think that was just about perfect. I made it into 2 loaves, although next time I will keep it as one loaf. Thank you for the great recipe! This looks and sounds delicious. I love making bread and I particularly love a bread that I can throw together after work and have on the table for dinner. That’s why beer bread is my favorite go-to dinner bread. But it doesn’t always work. I will be making this tonight or tomorrow and cannot wait to try it! We hope you like it Char! I made this bread the other day and it didn’t rise well and was kind of “gummy”. Thinking I might have done something wrong, I made it again tonight. It’s baking now. But I’m noticing that my bread develops big cracks during the second rise and doesn’t look like the picture you provide. I’m wondering if I should use more flour. It’s pretty humid here in Arkansas, so that could be the problem too. Any ideas? A few questions to help you troubleshoot… Are you covering the bread during the rise Lezlie? Are you baking it on a stone? In a pot? “gummy” bread usually means it’s not quite done cooking in my experience. Try using a meat thermometer to gauge the temperature – 220F is “done” unless the bread is getting too brown, too quickly. I’m hesitant to say add more flour if it’s cracking… that makes me feel like there’s too much. The dough should be smooth and elastic when it’s done kneading, with a slight spring back when you touch it with your finger. Let me know Lezlie – we’ll get you squared away! I am having a hard time getting beyond the name of this bread. It’s disgustingly sexist! Why is it okay for women to perpetuate sexism when we would all be up in arms about a man in a car ad claiming the car is so easy to drive that even a woman could do it. And the recipe was even developed by a man!?! I’m not quite sure I understand Amanda – yes, the recipe was developed by a man (Mr. Crumbs). He wrote the post too! We both thought it was an interesting play on words given the creator of the recipe, and the fact that many men tend to be “meat and potato” guys who love bread too. No offense intended here, just a great recipe that my husband created! Really? You’re offended (on behalf of men everywhere who could likely care less) by a bread recipe…? You just take your sweet time getting past the name of the bread while the rest of us rational folks enjoy eating it. Amanda needs to get over herself. This is about bread. Only people who take life too seriously would post that post. Relax, bake bread and enjoy life rather than examining it. Life is too serious to be taken so seriously. Slater an extra tablespoon on your slice of bread and life will look sweeter. Woo hoo! You’re welcome 🙂 Glad you loved it! Hi, If I added a lot of garlic cloves, would it still bake up nicely do you think? Any known problems i would encounter? Thank you. I think so, it’s pretty forgiving bread! Give it a try and post your results! This recipe is fantastic! Generally I don’t use bread flour for making bread– I just don’t think to buy it. I did use it this time and the texture is amazing. My daughter and husband loved it . Definitely making this bread again. Thank you so much. You are so welcome! Glad that you and your family loved the recipe! I have made this 3 times in the past week. 1st time=boule, 2nd time=2 sandwich loaves, 3rd time=1 sandwich loaf. 1 loaf worked best for me at 15 degrees less and baking until 215 with thermometer. The 2 load attempt ended with burnt too small loaves. Cutting when absolutely cool is key to easy cutting. Love the recipe! Thanks Alissa! Glad you loved it! Bryan, we haven’t tried this recipe using Einkorn, but I wouldn’t recommend it! Einkorn is tricky by itself. This recipe makes quite a nice loaf. A tad sweet with a soft crumb, it’s a winner. I’ve been making bread for a year or so now and have a few tips to make the process go a little smoother. If not using a mixer, try using a Danish Wisk. It’s perfect for heavier batters and I use it for all my bread recipes. I kneaded by hand (both actually) for about 12 – 15 minutes. For my last rise, I put the round boule atop a sheet of parchment paper that was placed over my pizza peel so when it was ready to pop in the oven, I just used a quick motion back out of the oven for minimum handling and deflation of the risen dough. Just before I placed it in the oven, I slashed deeply with a sharp knife, then spritzed with water and sprinkled on some coarse salt (flaked works nicely too). I like the speed of this recipe but it doesn’t take into account that it has to cool slightly before cutting into it (the hardest 20 minutes of the recipe). How does water affect the loaf? I like the idea of sprinkling a little salt on the top – a little extra goes a long way! I just have a quick question about the Hodgson bread flour. It says on the package high protein and high gluten. If I’m trying to stay away from gluten this probably wouldn’t be the right choice of flour then correct? Can you tell me which brand you use. If you’re staying away from gluten Anna, you’ll need to avoid any wheat-based flours – that includes all-purpose, bread flour, whole wheat, spelt, triticale, etc. Gluten is a protein in wheat, and flour is wheat berries ground up. Baking with non-gluten flours is not an easy undertaking. I don’t want to discourage you by any means, but it’s not as easy as a 1-1 swap. Could I replace the coconut oil with butter? We don’t like the taste of coconut. Why do you think I’m doing wrong? The bread usually comes out flat. It rises but wide not high. Does your yeast get foamy when you mix it with honey and hot water? 1 – is the coconut oil necessary? I dislike (intensely) the stuff so I’m curious if it’s needed or can be omitted. 2 – I don’t like honey very much, can I use anything else in replacement? Is the flavor very strong or not so much that I may not notice too much? Both the coconut oil and honey give the bread the unique texture of sandwich bread, but you can sub another fat (olive oil, melted butter) and sweetener if you’d like. The coconut oil taste is BARELY there, but I can’t taste the honey (and I usually can). I’ve found you can replace the coconut oil with another oil, I’ve used light olive oil and extra virgin olive oil. Also, I have used regular sugar in place of honey when I was out and it’s worked just fine. I hope this helps! Oh my goodness, this is so yummy! And it was super easy. Only my second time making bread, and this turned out a whole lot better than the first. I ate some as a snack with some oil & vinegar and it was perfect. Tonight we are having meatloaf, and it will probably turn into meatloaf sandwiches! This is the best recipe. We make 3 loaves a week and the only reason my boys eat it is because it’s man bread. I really work hard to keep them eating whole foods, its a huge struggle, and this was one thing they didn’t fight me on. Its the only bread we make and is perfect for our busy schedules. Thank you! Tiffany and Mr. Crumbs, I have to say this is an EXCELLENT recipe. DH, most of my children, and I make this bread with regularity. Really, even the children have mastered this recipe. It’s beautifully simple and some of the BEST bread we’ve EVER enjoyed! When making our weekly menus, it almost seems as if we try to think up meals that NEED this bread with them. It’s part of our regular “rotation” of bread recipes. I cannot thank you enough for this recipe. God bless you for your generosity in sharing this! Have a wonderful day. We have made this recipe 3 times, as-is, and I successfully made a swap-out for 1/2 whole wheat, last night (subbed 2 cups of the bread flour for 2 cups minus 2 Tbs of white/wheat flour and 2 Tbs of gluten); the 1/2 whole wheat version was my highest rise, yet. 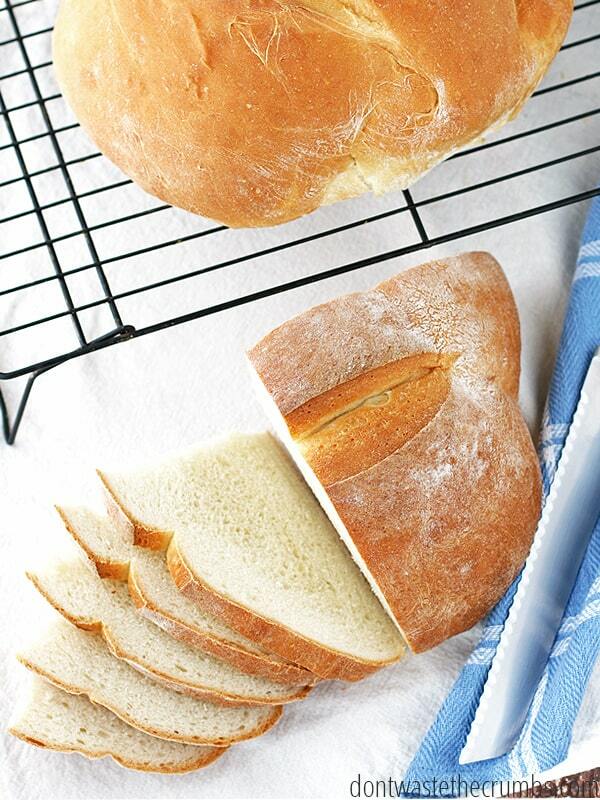 This bread makes perfect sandwich bread or toast. Absolutely lovely for BLT’s! We have been using the unglazed tiles as our baking stone for several years and have only had one tile break (I accidentally dropped an ice cube on a preheated tile, when adding ice to my broiler pan for steaming a loaf of crusty bread); I simply grabbed a new tile from the box and we were good to go. I was able to get good results making this recipe on my bread machine on the fast cicle. I also used 3 cups bread flour and 1 cup whole wheat. I love that I get a big bread and it lasts longer, otherwise I need to make bread every other day. Having the bread done in 2 hours instead of 4 or 5 (on the normal cicle) is a plus! Hi Tiffany, I’ve been watching & enjoying your “Kinda Crunchy” periscopes this month (not sure why you showed up on my feed one day). Today is the first day that I actually made the link / jump to the blog. (I’m kinda slow 🙂 ) So in honor of the “make something from scratch challenge, I made this. 🙂 I didn’t have bread flour or vital gluten, so I just used what I had which was 2 cups of AP and 2 cups of King Arthur’s white whole wheat. Combining that with my old yeast I didn’t get a super huge loaf. But I made homemade bread from scratch! Win for me for today. We try to stay away from white flour but I have been having a hard time finding a good whole wheat flour bread recipe. Does this one works with whole wheat flour? Any one tried it yet? I love bread and have made the overnight Artisan Bread many times. I like the shorter time factor for this bread. Have you tried it with instant yeast as that is what I usually use and have on hand. If so, how much did you use? If not, I’ll just go out and purchase the regular yeast! Can’t wait to try it! I’ve been baking bread for about 35 years. I have some tips that might be useful to someone just starting out. If the bread is cracking, the reader may have forgotten to slash the bread on top. That keeps it from cracking as the bread expands. It also may have had too much flour to water. Since most of us use cups instead of weighing the ingredients, there’s a great variation in “1 cup”. Had to do with humidity of the area, the house and where it was made, how long it was stored in a paper bag, etc. I know that when I open 100% whole wheat flour canned in a #10 can in UT, it soaks up a LOT of water and I end up needing to add more water. When I open a bag of flour from the store, I’m having to add more flour (GA is VERY humid), as the flour already has used up some of it’s “soaking” power from the humidity. When I bring home yeast (I just use regular yeast like Red Star, not a rapid or instant yeast in my baking and everything has turned out fine), I place it in the freezer. I’ve baked wonderful loaves with yeast that had an expiration date FIVE YEARS before I used it. But it has always lived in my freezer. It was bulk yeast that was vacuum-sealed. Once opened, I kept it in the original Mylar bag and put that bag in a zip bag, rolled down the Mylar, squeezed the air out of the zip bag and sealed it and back into the freezer it went. Because I know my yeast is good, I don’t “proof” the yeast. I simply mix it in with the flour, sugar (if not using honey) and salt. Add the liquid ingredients and Bob’s your uncle. I make a similar recipe to this (I’ll have to try the coconut oil, I’ve been using olive oil in mine, but this sound delicious!). I’ve used everything from AP to 100% whole wheat and it’s come out fine. I did learn a trick with whole wheat flour. My recipe calls for 4 cups of flour. So I add 1 Tbs of the vital wheat gluten in with the wet ingredients (I usually use my bread machine for making bread). I have also added bran and wheat germ to AP flour to add some more goodness to the white flour (If I used 1/2 cup of each, I’d leave out 1 cup of flour). Both ways give me a foldable sandwich bread. You can add garlic, cheese, onion/garlic powder or any other add in’s you’d like. It will work. Add it in after you’ve kneaded it for a while and it’s almost ready for shaping. You can also add more sweetener to this and make cinnamon rolls, sticky buns or pecan rolls, etc with this dough. You can use this dough as Mr. Crumb has written it for hamburger buns, hotdog buns, dinner rolls, pizza dough, calzone dough, bread sticks, hot pockets, and any other shapes/recipes that are bread based. Shape, fill (if you’re adding filling) let rise, slash breads, buns, rolls calzone/hot pockets. Don’t slash pizza, bread sticks, etc. Sprinkle any toppings (seeds, cheeses, onion, garlic salt,) you want and bake. You can divide it into smaller loaves – just use mini loaf pans, cupcake pans, or mini-muffin tins. Only fill 1/2 of the way and let rise until doubled. (whole wheat will not double, but it will expand just over 1/3, so fill pans 2/3 full). Or divide dough, separate and put on parchment on a baking tray, let rise, slash and bake for rolls/buns. Really helpful tips, Darlene. Thanks! I don’t think I’d recommend this one for a bread bowl, but my Overnight Artisan bread would work! I just pulled my attempt at this recipe out of the oven. It looks and smells so good!!! I can’t wait for it to cool so I can try it. So I am a huge fan of the No-Knead Artisan Overnight Bread and that’s been my go-to recipe for months. I wanted to try this recipe but didn’t have any bread flour… I picked some up the other day, finally, and remembered that I wanted to try this. Man, am I glad I did! I have made 5 loaves in 3 days because this stuff is so good! (No, we haven’t EATEN that much… I’ve frozen some.) I really want to get away from storebought bread because it’s neither cheap nor nutritious. And at 2 hours from start to finish, this bread is definitely my go to recipe now. Hi, Tiffany. Once again, this bread is making the rotation in our weekly menu. Tonight’s bread was baguette. Was it REAL FRENCH baguette? No. Was it delicious? YES! This recipe, with more flour, maybe 1/2 C, made two baguettes. One is in the freezer for another day. Thanks, Tiffany. I do believe this is our most favorite bread recipe. Simple and delicious. How very kind of you to share! Have a great evening. Thanks for the raving review M! And I appreciate the tip about turning into 2 baguettes. We’ll try that next time! Oh no Ashton! Question – was the oven preheated fully and did it bake for a full 25 min? We’ve only once had a slightly doughy middle, and that was b/c my husband overloaded on the coconut oil, LOL. Wow! I had to use all purpose flour because it was all I had. Then I ran out and finished with whole wheat. I probably used 25% whole wheat. This was great. I can’t wait to make it again and really follow your directions using bread flour. Thanks! We made this with whole wheat flour and it turned out great. I say that because all nine of our children commented on how good the bread was. I still can’t wait to use bread flour and see the difference. Thank you for the wonderful and easy recipe!! Thanks for sharing this Hope! So great to know it works just as well with whole wheat flour! New Favorite bread recipe 🙂 Thanks a million! It’s so easy and extremely quick when we’re in a pinch. As to how to transfer the risen dough to the baking stone without losing loft– for the second rise I place mine on a piece of parchment paper then place that on my wooden pizza thingy (what you use to put a pizza in the oven!) then, when you are ready to put the bread in the oven, pull the rack out with the hot stone on it, line up the paper with the stone and slide it right on. Voila! No loss of loft!!! Works perfect for me every time! This is by far our favorite bread!! That’s a pretty genius method Bronni! Thanks for sharing, and I’m thrilled you love the bread! I’ve always been nervous to try bread that require kneading. I don’t have a machine so I did it by hand and it turned out great! It was neat to see how the dough transforms as you need it. Thanks for putting together this awesome recipe. My husband and I love it! How would rapid rise yeast work with this recipe? This recipe is fantastic! It’s also very adaptable. I have added honey and separated it and made high rise dinner rolls, added crushed garlic and fresh rosemary for focaccia, cinnamon and brown sugar for breakfast bread that also makes incredible French toast. I make at least one loaf a day!! My family won’t eat store bought bread anymore!! And I figured my cost is about $.85 a loaf!! Thank y’all so much for sharing this with us!! This is by far our favourite and easiest bread recipe. We make it all the time. We’ve adapted it a little to suit our tastes as a family, and it is made at least once or twice a week. It’s so easy my 2 and a half year old can make it with me! This bread is nothing short of amazing. Honestly, I’m not sure why it came out any different from any other bread (the only substitutions are honey for sugar and coconut oil for oil) but this is a tasty, light, fluffy bread. It tastes exactly like the breads from La Madeleine’s French Country Cafe. Somehow this bread has sour dough flavor and crust without being a sour dough bread. Thank you for the recipe, Mr. Crumbs. This will be a new family favorite. This is the BEST bread ever. My kids love it and my husband doesn’t want bread from the store anymore. I have zero experience making bread and this was a piece of cake. Yay!! Thanks for the rave review Alyssa! 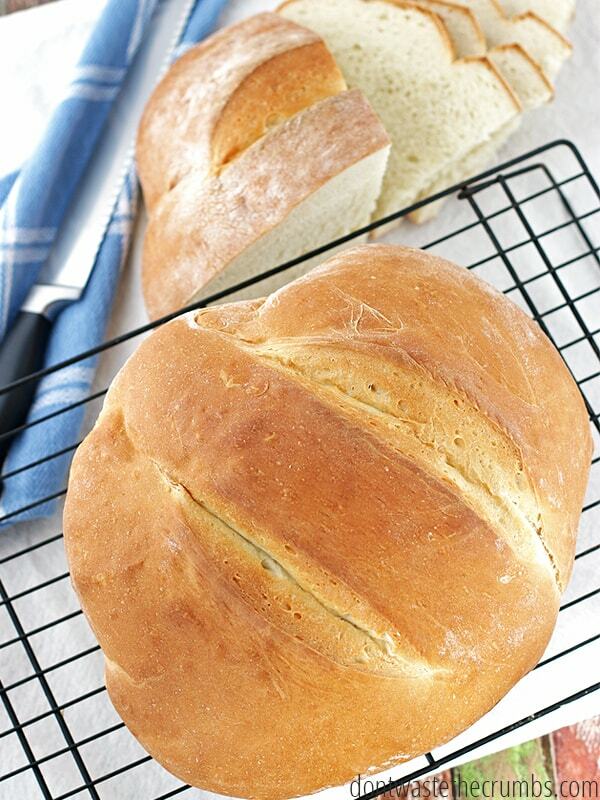 I’ve tried many bread recipes and this is by far the easiest and the family favourite! I sub the coconut with EVOO and bake it in a loaf pan with no issues! Makes a perfect sandwich loaf that never lasts long in our home. I’m so glad you like it Dani!! Thank you for sharing your recipe Tiffany. I have just made some. It was so quick and easy ! I have put a photo of it on my Sussexmouse blog with a link back to you. I will be trying more of your recipes. Wonderful! I made a test loaf last night and another for work early this a.m. It was a hit! Thanks so much for sharing! Hi Linda, We don’t have any nutritional information listed on our recipes. However, you should be able to plug in the ingredients on a nutritional calculator to find out. Hi there! I don’t have a pizza stone. Can this be made on a cookie sheet? If so, does the cookie sheet need to be preheated? Can it be made in or in a standard loaf pan or will the loaf be too big for the pan? Thank you! Hi Jennifer! Yes, it can be made on a cookie sheet and yes, it would need to be preheated. You can also make this loaf in a pan, and it will likely be very big. If you divide into two pans, you’ll get slightly smaller than average-sized loaves. ok…so…Holy Heck!! This bread will make you slap your Mama! So so delicious. And easy?? Heck yes! Thanks, Crumbs! You guys are killin’ it! So yummy! Good thing it’s easy to make because my family devoured the whole loaf at supper. Yay!! So glad y’all liked it! Can I use instant dry yeast instead? Hi Jan! There are several converters on the internet that can take care of that for you, and yes, you can use instant yeast. Any tips for freezing it? Should I freeze it after it’s been made and cooled? After it’s been mixed in the Kitchen Aid but before it rises? We’ve made it twice and it’s quite tasty. Thanks for the recipe! Tiffany, has anyone tried to do this with sourdough starter? I have some/one that I have been feeding all week and would like to try to use it. I have made it per your recipe and we loved it. I haven’t heard of anyone doing it yet, but if you do, please let me know how it goes! I just discovered this recipe, and it sounds delicious. I’ve never made a loaf of bread before. Is this a good one to try first? Also, how do you store your bread to keep it fresh and how long will it stay fresh? Thanks in advance! Oh yes Cindy, this is a great loaf to make as your first loaf of bread! We keep it in a plastic ziploc bag on the counter and it’s good for 3-5 days. You can store it in the fridge to extend it to about a week or so, or put it in the freezer for 6 months! I have never frozen bread. When ready to use do uou just let it defrost on the counter? Does it get soggy? Yep! The counter is perfect and no, it doesn’t get soggy! Can I cut this recipe in half? If so, any other changes to make? Can’t wait to make it! You can, no other changes to make. Worthy to note though, is that bread freezes REALLY well. If it’s just you or a small family, it’s worth to make the recipe as written, divide into two loaves and freeze one loaf for later (less work in the end!). Which size jar of coconut oil do you purchase? How often do you find it 50% off? Also do you have a large container of yeast you recommend? How much flour do you typically buy in bulk? Has Costco been the cheapest? Thanks for any tips! The first attempt at man breast resulted in crispy on outside and undercooked on inside- not sure what I did I wonder if I should split the dough before baking? Hey Stacey! I buy coconut oil in bulk from either Costco or Tropical Traditions (Costco, more recently). TT often has it 50% off, or BOGO, but shipping is still costly. I buy 2 lbs yeast from Amazon and store it in the fridge. Red Star is usually the most affordable. I buy either 25 lb or 50 lbs of flour from Costco, and yes, they’ve been the cheapest. I’ll look at bulk grains for milling at home later this year. Made this for the first time this morning! Used AP flour from Montana Wheat…added the gluten. Divided in two and baked in loaf pans. Cool day here, increased rise times a little. Bake time 27 min. Turned out spectacular. This is our new “go to” sandwich bread! Had to email Tiffany a pic. I saw them Hal – they’re BEAUTIFUL! Hi. So I tried this yesterday, and I’m hoping you can help me! I don’t have a stand mixer so I kneaded by hand for about 8 minutes. Used half wheat, half white bread flour. Baked on a cast iron skillet. Had to bake at 400 for almost an hour to get inner temp to 220. The taste was okay, but the bread itself was really dense, and the crust was really hard. Any help would be so greatly appreciated! This is a denser than usual bread, since the rise times are so short. Next time I would knead by hand for 10-15 minutes (since you need 10 with a mixer) and knead again 10 min before shaping. Shape into a log-ish shape, rather than a boule, and your cook time should shorten a bit. Also, the internal temp can be anywhere from 190-200 to be considered done. I hope that helps! I kneaded, as you suggested, for 15 minutes before the first rise; about 12 the 2nd and shaped into a roll. And when it was done and sliced, I had to hide what was left from the family! Oh, I went 3 cups white bread flour, 1 cup wheat. Absolutely delicious! So glad you enjoyed this recipe!! I was able to make this with 3.5 cups whole wheat flour and 1/4 cup vital wheat gluten, and while it was a little denser, I was very pleased with the results! Yay Andrea! So glad WW worked for you! Have you used this recipe to make rolls or buns? No, but you certainly can! First of all, your blog has transformed our budget and our ability to feed our family of 5 a (delicious) variety of homemade and Whole Foods. Second, this recipe is perfection. I would agree with other posters, the size of this loaf yields the perfect sandwich size as is. When halved it makes a nice loaf for bread and butter for dinner, but doesn’t have enough surface area for a “man sandwich”. I kept it as one loaf, decreased heat to 385 and 27 min was perfect. This is the only bread we eat! No more store bought for us! I made a small change. After the first rise I place the dough on a floured board and cut it in half. I need each loaf just until smooth then I place them in 2 greased loaf pans and do the second 30 minute rise. We love having loaf bread for sandwiches!! Thanks for this great recipe!! Hi Judi! Yes you can substitute instant yeast, and this recipe makes one giant loaf. I have one cast iron bread pan and one that is regular metal. I bake them one at a time. If I add 10 to 15 minutes to the baking time, should I turn the oven temp down? Came across this recipe yesterday and since I’m an experienced bread-baker, I thought I’d give it a try and streamline it a bit. Didn’t change any of the ingredients but, instead of using my KitchenAid mixer with the dough hook, I put the ingredients in the bread machine and set it to DOUGH. Only let it rise for 30 minutes in the machine. Shaped it into a ball and placed it into my microwave for the second and final rise. Before I put the ball into the microwave, I heated a cereal bowl of water on HIGH for 4 minutes to create a warm moist environment. WOW! What a beautiful and large loaf. Slashed it as directed and baked it. I see some delightful grilled cheese sandwiches for our lunch today. How many calories to a slice? Hi Barb! Since we all slice differently, I don’t include nutrition information on my recipes. You’re welcome to input the recipe in a recipe calculator though!